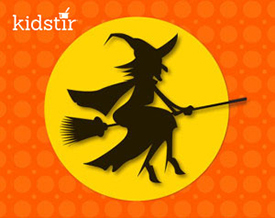 Click the “Download Here” link above to print our Flying Witch on a Broom kitchen decoration. Cut out the witch along the dotted lines. Want to decorate your front porch with scary carved Jack-o-Lanterns – here are the Kidstir Pumpkin Carving Templates you’ve heard about! Looking for some more Halloween treats for kids? Try these!